The research for my new book ‘Cooking for Happiness’ keeps me busy for quite some time now. It seems to me that science has not acknowledged sufficiently yet how much food is influencing our mood. During the recent decade however, there has been a lot of progress. "Food is like a pharmaceutical compound that affects the brain," wrote Fernando Gómez-Pinilla, a professor of neurosurgery and physiological science, in 2008 on the website of the University of California (UCLA). Like my other books, I intend to write ‘Cooking for Happiness’ based on my experience. In this month’s newsletter I publish my first recipe developed for this book. 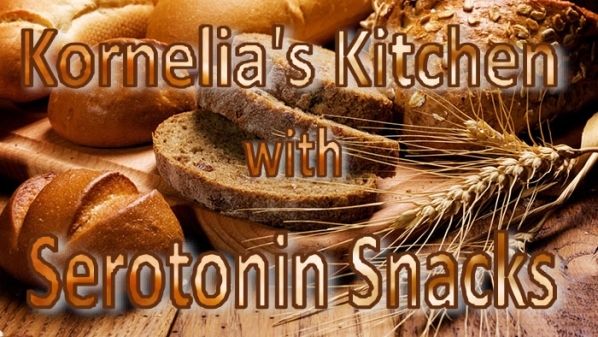 In the article below, ‘About serotonin, insulin and the blood brain barrier’, I explain why I call my whole-wheat rolls serotonin snacks. Actually, I have experimented for years with making bread – without chemical additives - but the results never really satisfied me. Then I watched a show on TV showing how the French craft their baguette. I love, love, love baguette. Nowhere in the world smells bread as lovely as in France. I believe they have their own brand of yeast that produces the wonderful scent of baguette. Anyway, I would never dare to try making baguette but I learned two things from this show: It takes two days to make baguette and they sprinkle the baguette with water during baking to get a nice crust. 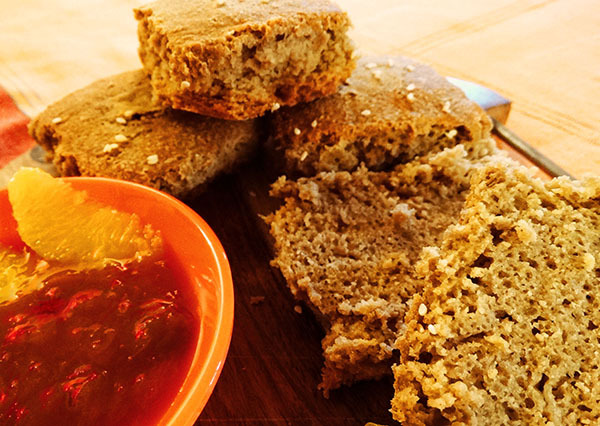 I incorporated these techniques into my humble bread rolls and voilà! For the first time, I really liked my rolls – and I know exactly what I went into preparing them. Even my son, as you might know a picky eater, calls them delicious. They are quite dense and you have to chew them well, but as far as I can tell, they really raise the level of serotonin in the brain. Please read my explanation below to understand how and when you have to eat them. 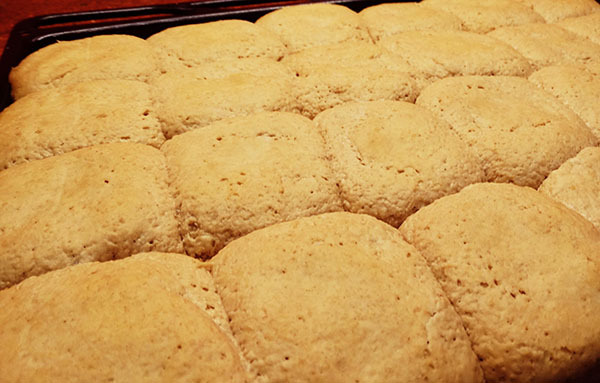 You need time to make these rolls, but the method itself is very easy. First you have to wake up the dry yeast. Remember that yeast is a fungus, which loves a warm, moist environment. I used to heat up the water to start the dry yeast but many times I made it too warm and killed the yeast instead. Here in Goa, India, the weather is actually so warm that you can use water at room temperature and it works just fine. If you live in a warm climate, you might want to warm up the water a little. Take about half a cup of water, stir two tablespoons of sugar into the water and add the yeast. Now wait until bubbles start to form. When you see the bubbles you know that the yeast has woken up and wants more food. Place the flour and the bran into a big mixing bowl. I like oat bran because it gives a slightly nutty flavour to the bread. 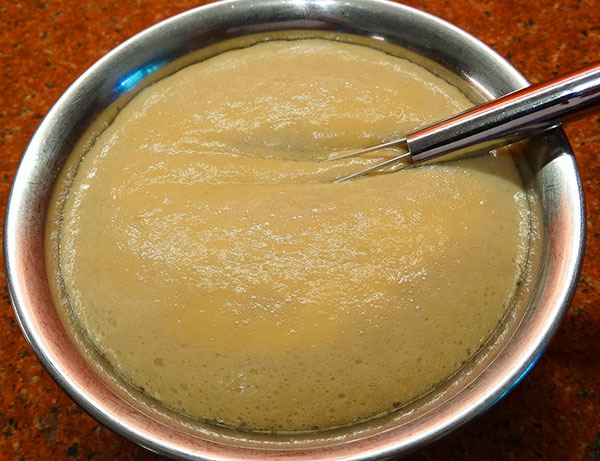 Dig a hole in the middle and pour the yeast mixture into the hole. Cover the yeast with flour and wait until the flour over the yeast shows cracks and the yeast bubbles spill out. Now sprinkle the salt over the flour, place a container with water next to your mixing bowl and dive in with your hands. You need to mix the yeast with the flour and water until you have smooth dough. Be careful with adding the water. 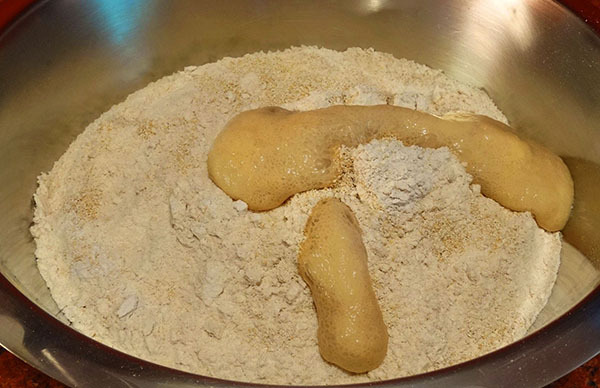 Start by adding one cup, mix it in and then keep adding more until you have incorporated all the flour. You need between half and three quarter of a litre. The dough should be elastic without sticking too much to your hands. If you have added too much water and the dough remains sticky, add some more flour. If the dough crumbles and does not come together well, you need more water. Cover the dough with a wet cloth and let it rise in a warm, safe place for about two hours (also three hours would not hurt). When the dough has doubled its size, knead it again. This second kneading makes sure the yeast is distributed evenly through the dough. Spread a silicone-baking sheet or baking paper over a cookie sheet and make 24 little rolls from the dough. To divide the dough evenly, I first halve it, and then halve it again and again. The remaining eighth of the dough is enough for three rolls. I shape the dough into balls and place them onto the cookie sheet. 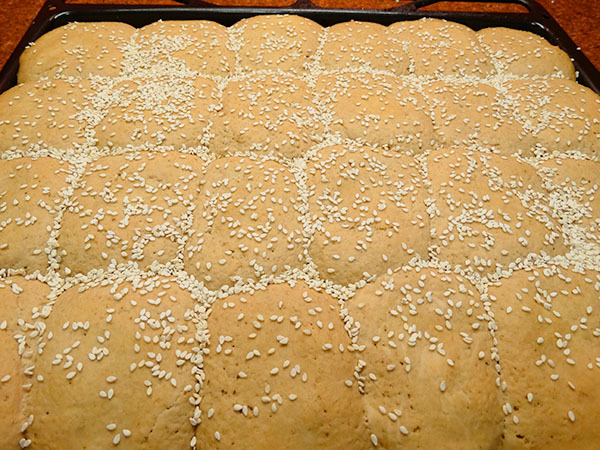 If you want to sprinkle sesame or poppy seeds over the top of the rolls, do it now and press the seeds slightly into the dough. Now make the cloth really wet, spread it gently over the rolls and let them rise overnight. That is not as long as the two days for baguette, but it really makes a difference. It is important that the covering cloth is wet enough to keep the rolls moist over night. Finally, it is time to bake the rolls. I bake my rolls for one and a half hours at lowest temperature (180 degrees) in my gas oven. After three quarters of an hour, spread the wet cloth over the rolls to moisten the surface. You should see some steam rising. Repeat this at least two more times. Because the flame in my gas oven comes from the bottom, I use the grill for around 5 minutes at the end of the baking time to give the top of the roll a nice crust. If you have an electric oven, this might not be necessary. Enjoy! Our bodies are complicated organisms. They depend on many things; the neurotransmitter serotonin is one of them. Serotonin is one of the most common neurotransmitters in nature. Even the simple amoeba uses serotonin. In our bodies serotonin acts in many different ways. About 90 percent of all the serotonin in our bodies is found in and around our digestive system where it regulates the movement of our gut. In our brains, serotonin is influencing our mood. Well-balanced serotonin levels lead to a happy, relaxed and confident outlook on life and good sleep. Many scientists nowadays believe that low levels of serotonin are a major cause for depression. However, it is not easy to raise the levels of serotonin in the brain. 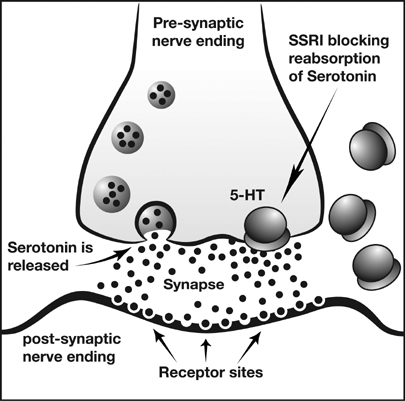 You can eat serotonin supplements, but they will not reach the brain due to the blood brain barrier. Only the amino acid (protein) tryptophan and its metabolite 5-hydroxytryptophan, the building blocks for serotonin, are able to cross this blood brain barrier – and this only under certain conditions. I have read the following explanation for this mechanism in ‘The Serotonin Power Diet’ by Judith J. Wurtman, PhD, and Nina T. Frusztajer, MD, a book I can recommend if you want to explore the benefits of serotonin further. When you eat a meal rich with protein, your digestive system sends them into the blood. There they compete with each other to enter our brain. At this time, tryptophan has no chance to cross the barrier because the other amino acids clutter the entrance. The carbohydrates release the hormone insulin from the pancreas. Insulin pushes all the proteins from the blood into the organs – and makes the way free for tryptophan to enter the brain. Once it has reached the brain it is quickly converted into serotonin. For around half an hour after eating a serotonin carbohydrate snack you should avoid eating anything with protein or fat. Don’t expect any immediate results. It takes about two weeks to build up serotonin levels. Although my husband and my son might disagree, I feel a lot better after using this trick with the serotonin snacks for about two months now. I also sleep a lot better. One more time in short: Eat a serotonin snack two hours after a protein rich meal and then wait for half an hour before eating fat or protein. By the way, many common antidepressants work with serotonin. 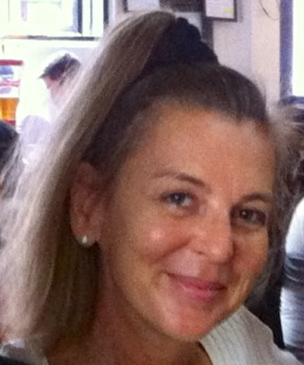 For example, Prozac is a serotonin re-uptake inhibitor (SSRI). That means it makes serotonin stay active longer in the brain.